Smallmouth bass were once considered just a northern relative of the black bass family. Now smallmouth bass fishing is now an All-American gamefish pursuit. Smallmouth bass live in many habitats ranging from cool waters of rivers and streams to deep reservoirs and crystal-clear natural lakes. You can find smallmouth bass in waterways either above or below the Mason-Dixon Line. Many bodies of waters contain large smallmouth populations, but certain fisheries tend to produce more and bigger smallmouth bass than others. Do Smallmouth Bass Only Eat Small Baits? 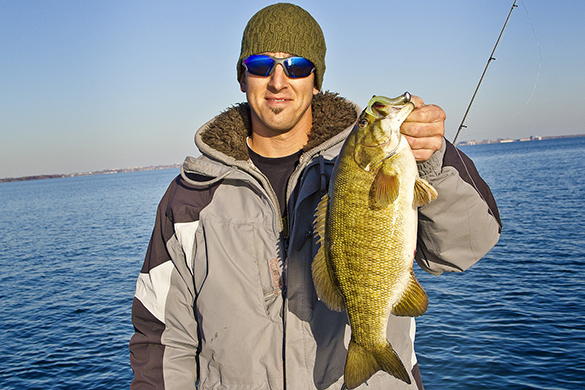 Novice anglers tend to think that smallmouth bass only eat small baits because of their name. However, savvy smallmouth anglers know these voracious eaters will attack anything, even if it is more than a mouthful. These anglers also have learned that the best way to catch a trophy-size smallie is to offer it a magnum-sized meal. Even smallmouth on streams with gin-clear water can be taken consistently on larger lures with standard casting gear. Some of the most productive lures for stream smallmouth fishing are 1/4-ounce spinnerbaits and buzz baits. 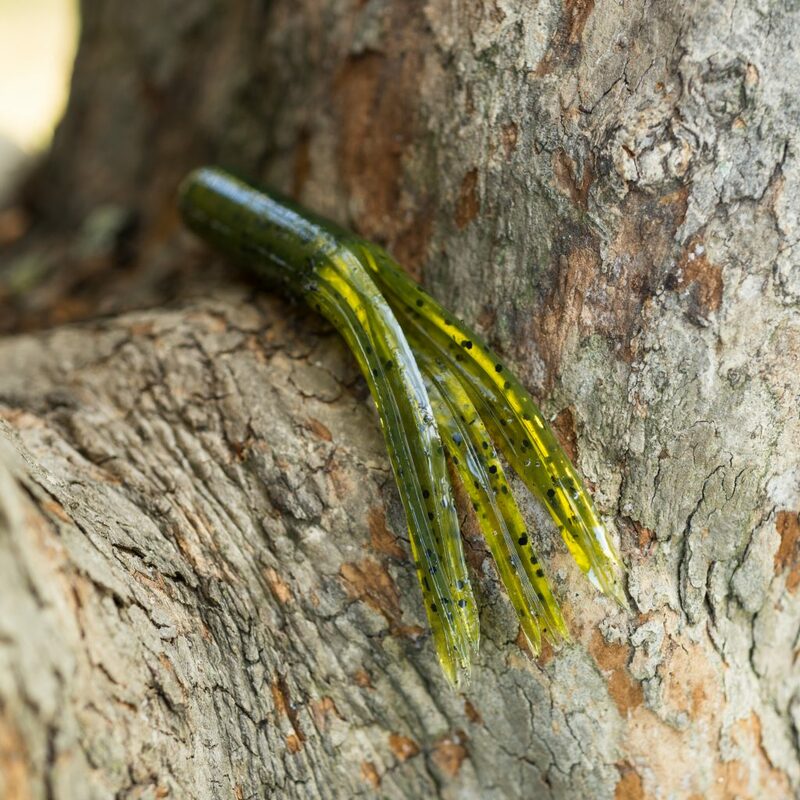 Soft plastic lures, such as spider-style plastic grubs (rigged on 1/8- to 1/4-ounce jigheads), tube baits, jerk baits and 6-inch plastic worms are also popular. Choose stream lures to imitate crawfish or minnows in four basic colors: brown, white, silver and chartreuse. Smallmouth on the big waters of natural lakes and man-made reservoirs will also hit spinnerbaits as large as 3/4- or 1-ounce models with number 5 willowleaf blades. Other big baits for taking heavyweight smallies include 5/8-ounce buzz baits, 1/2-ounce jigs tipped with bulky plastic chunks or craws, 5 1/2-inch suspending stickbaits, deep-diving crankbaits and Zara Spooks. One of the most fun ways to catch topwater smallmouth is on a Whopper Plopper 90. Any soft plastic bait that imitates gobies is deadly for smallmouth on the northern lakes infested with the invasive species. Dragging plastic tubes or drop-shotting finesse worms or small soft-plastics imitating gobies or minnows are two of the most popular tactics for catching northern smallmouth. 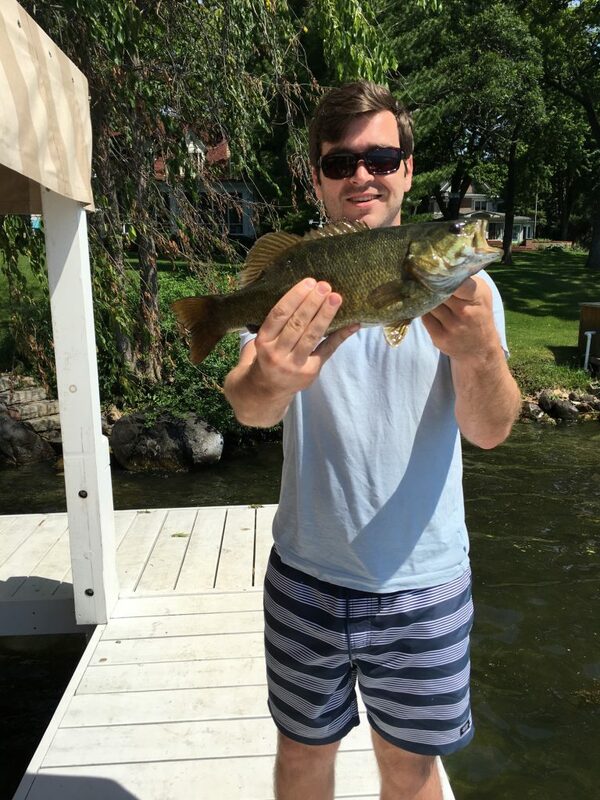 Fishing for smallmouth bass on the Great Lakes, Lake Champlain and other large natural lakes in the north can be fantastic, but it can also be frustrating when trying to find brown bass in those vast expanses of water. Knowing the seasonal patterns of smallmouth is the key to finding these fish on massive fisheries. From April through June, northern smallmouth will be in various stages of the spawn congregated in depths of 10 to 20 feet. By late June and July the fish move to deeper structure n the 20 to 25 foot range. By August the fish have moved to the deepest structure (25 to 35 feet) before moving back to the shallows again in the fall. Good electronics with mapping are crucial for finding the isolated rock piles, expansive flats, rocky points, reefs and shoals that smallmouth favor on the big waters. While some smallmouth will suspend over structure, most of the time the fish will hold within about 5 feet of the bottom since their main forage of gobies always stay close to the lake floor. 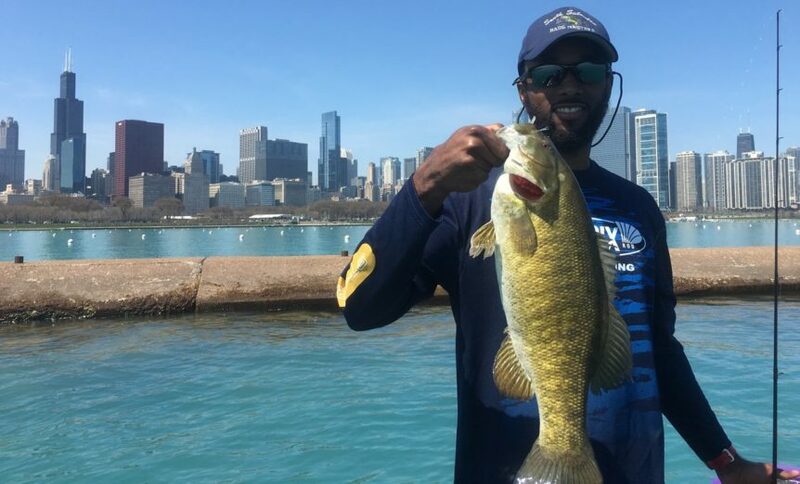 Since smallmouth will be gorging on gobies rather than chasing baitfish, the key to triggering strikes is keeping your bait close to the bottom. Whereas the northern lakes freeze up in the winter, the man-made reservoirs below the Mason-Dixon Line provide year-round access to smallmouth bass fishing. During the winter, reservoir smallmouth tend to gather on channel swings and in the middle of deep guts at depths of 25 to 30 feet. Vertical jigging with 3/4-ounce slab spoons or bumping tube baits or finesse jigs along the bottom are effective tactics for catching wintertime smallies. In early spring, prespawn smallmouth move to secondary points on their migration to spawning areas in pea gravel coves or gravel flats. The best baits for prespawn smallies include medium-diving crankbaits in crawfish or fire tiger hues, jigs tipped with plastic chunks and plastic grubs. When the fish start nesting, try a Mojo rig with French fry-style finesse worms or 6-inch plastic lizards. After the spawn, reservoir smallmouth move into the 8- to 10-foot range along pea gravel points where they can be takin on the Mojo rig or small crankbaits. Summertime haunts for reservoir smallmouth bass fishing include humps and drop-offs of pea gravel points where the fish hold at depths of 15 to 25 feet. A Carolina-rigged French fry or plastic lizard is best for catching smallmouth in the heat of summer. When fall arrives, brown bass move back towards the shallows and can be caught anywhere from the bank out to 20 feet deep. The fish will scatter along the gravel banks of the creeks and on the main lake so try fast-moving lures such as spinnerbaits in white or chartreuse or medium-diving crankbaits in crawfish, fire tiger or bluegill colors. 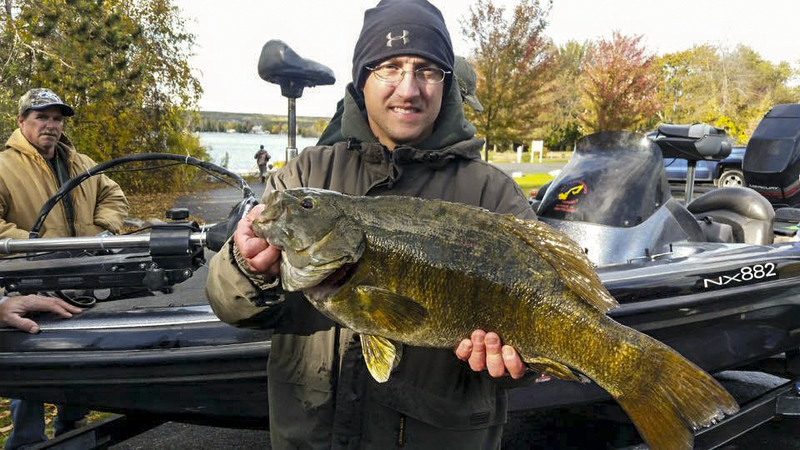 Wind-blown banks usually produce the best action for reservoir smallmouth in autumn.